Dave Ramsey at the Smart Money tour stop in Louisville in 2O18. Dave Ramsey is the almighty slayer of debt. Not just in Brentwood, Tenn., where he broadcasts his radio program for three straight hours every Monday through Friday. Or in the slices of the heartland where his billboards dot highways and his live events pack churches the size of minor league baseball stadiums. But in the entire country, y’all. A proud evangelical Christian, Ramsey rules the airwaves with a tone that rests in a measured Southern twang and then rockets, without warning, to a full-volume shout. Like when someone dials his call-in hotline, and he’s forced to tell them just how stupid they sound. Why would you invest in something you haven’t researched? You’re a grown man with a family, and your daddy’s still taking care of you? When are you going to quit freaking spending money that you don’t have? Sometimes, the collective irresponsibility of American consumers puts him in a particularly sour mood, and he starts hollering at no one in particular. Credit cards? Stupid! Car payments? Stupid on steroids! Borrowing money on your house to put in granite countertops? SOMEBODY OUGHTA SMACK YOU! That’s just stupid! Ramsey’s been at this carnival-barker-with-’roid-rage shtick for nearly 30 years now. His first radio gig, The Money Game, debuted in 1992, and he became something of a personal finance superstar after his 2003 self-help book, The Total Money Makeover, made the New York Times bestseller list. Today he’s sold more than 5 million copies of that book, according to its publisher. He’s 58 now, and while his advice hasn’t changed much over the years, it’s somehow not old hat. Roughly 15 million people tune in to The Dave Ramsey Show every week, according to an interview a Ramsey Media executive gave to InsideRadio earlier this year. His podcast was the fifth most downloaded program on the Apple app in 2018, the company says. And in the talk radio world (the live version of his show airs on more than 600 stations nationwide), only Rush Limbaugh and Sean Hannity have bigger audiences. Ramsey’s listeners face new hurdles now. And in an era of egregiously expensive college tuition, a sky-high cost of living, stagnant salaries, and rampant consumerism pushed by social media and its “influencers,” he’s won over a new crop of supporters. You can hear it in the calls he takes every day from panic-stricken young people struggling to make ends meet. On Instagram, freshly converted twenty- and thirtysomethings use hashtags like #debtfreescream and #debtfreecommunity to talk about their Ramsey-inspired journeys. It’s an audience that marketers stake their entire budgets on, and he’s speaking to them in all the wrong ways. He quotes scripture and Ronald Reagan. He calls young people “snowflakes.” He has absolutely no chill, whatsoever. But for a growing swath of millennials—a generation we’re told is too fragile, too godless, too politically correct—his word is gospel. In rant we trust: Dave Ramsey’s network encompasses radio, TV, live events, and millions across multiple social media channels. On a freezing February night in Grand Rapids, Ramsey hit the stage of a megachurch called Resurrection Life to thunderous applause. The crowd had been waiting semi-patiently—George Kamel, the host of Ramsey’s video channel, pumped everybody up by tossing footballs into the audience and taking selfies from the stage. Grand Rapids was blanketed in an ice storm earlier that afternoon, so much of the crowd had to drive through miles of slush to make it in. But 4,000 people still showed up, Ramsey said later. As they streamed into their seats, a cluster of fans clamored to get photos with the man of the hour in a “VIP meet-and-greet” offstage, a $100 add-on to the event’s $49 admission. There were snacks, free copies of The Total Money Makeover, and a Q&A session where attendees could lob questions at Ramsey town-hall style. How long should you wait before buying a house? If you’re in your twenties, what percentage of your income should go toward retirement? When is it okay to go back to school? It’s one of Ramsey’s favorite non sequiturs. In his view, many of our country’s financial problems could be solved if young people (and their parents) stopped making such stupid freaking decisions. His origin story, which he repeats ad nauseam at most of these events, is meant to guide them to the light. In the mid-’80s, Ramsey and his wife, Sharon, were riding high with a $4 million real estate portfolio. But after the bank financing those loans was sold, the new owners demanded repayment. Ramsey couldn’t cough up the cash and almost lost everything. In the depths of despair, he started studying what he calls “biblical finance” (“The borrower is slave to the lender,” “Let no debt remain outstanding,” et al. ), and the scales fell from his eyes, as it were. Today, Ramsey’s core advice is driven by the seven “baby steps” he devised after digging himself out of that hole. You start with a $1,000 emergency fund and then throw all your discretionary income into paying off your debts—no saving for retirement, no eating out, no shopping for things you don’t absolutely need—until you’re in the clear. It all revolves around what Ramsey calls the “debt snowball,” a money management plan that teaches people to attack their smallest debts first and work their way up to the largest. This is controversial (paying off your debts with the highest interest rate rather than those with the lowest dollar amounts is usually the faster, expert-advised approach), but judging by his loyal, growing fan base, his methods work for a lot of folks. Ramsey’s advice—in books, on-air, and otherwise—tends to target a certain type of person: someone who lives in a house (not an apartment), owns a car (not a subway pass), and has at least a modest reverence for the Christian God and a strong Second Amendment. Lately, though, his advice has echoed beyond those circles. Even in Western Michigan, where the biggest applause break came after Ramsey took out his wallet to show off the “only four pieces of plastic” he carries—a business debit card, a personal debit card, a driver’s license, and a concealed-carry permit—there were people like Tieka Ellis. Tieka is a 32-year-old graphic designer with Jane Birkin bangs, an apartment in a hip Grand Rapids neighborhood, and, if her Instagram is to be believed, a closetful of very enviable clothes. In the crowded megachurch, she sits four rows from the front, next to her husband, Eric, a 30-year-old customer support technician. They’re both liberal, “not traditionally religious,” and radiate a sweet, humble energy that probably makes everyone they meet want to be their best friend. In other words, they have almost nothing in common with Dave Ramsey. Tieka and Eric turned to Ramsey’s advice when they were $60,000 in debt, 80% of which was in student loans. Tieka says she’s always liked following programs with clear directives and baked-in checklists, like Weight Watchers. “I’m an ‘Enneagram Type Three’ achiever, which I realize is a very millennial thing to say,” she tells me, referring to a Myers-Briggs-style personality test that is very “in” right now. In 2017, Eric bought her The Total Money Makeover for Christmas—she says she read it cover to cover in one night—and they decided to give his “baby steps” a shot at the start of the New Year. Eric and Tieka Ellis’s debt-free sign shared on her Instagram. For the next 11 months, they followed tried-and-true Ramsey-isms fans can rattle off like the Lord’s Prayer. They sold everything they didn’t “need or love” on Craigs-list, Facebook, and at yard sales. They got deliberate with their spending, trading expensive cocktails for PBRs and restaurant dinners for home-cooked meals. And even though it was “kind of scary,” Tieka admits, they drained their savings down to $1,000 and threw every extra dollar they had into paying off their debts. Last December, Tieka posted a photo of herself and Eric holding a “We’re Debt Free!” sign on Instagram. Today, they’re saving for a down payment on a house and listen to The Dave Ramsey Show every day for motivation. Ramsey declined to talk to me for this story or provide a demographic breakdown of his audience. But millennial fans like Tieka and Eric—anyone born between 1981 and 1996, according to the Pew Research Center—do make up a substantial part of his listener base. In Grand Rapids, he brought along Anthony ONeal, a regular guest on his show who speaks almost exclusively about paying for college. At one point, ONeal asked anyone in the crowd under 30 to get up from their seats, and easily a third of the audience stood up. Ramsey’s got a growing social media presence too. More than 6 million people follow him across Twitter, Instagram, and Facebook, where he cross-posts nuggets of dad wisdom (“People change their life when they finally say, ‘I have had it!!! Enough!! I am sick and tired of being sick and tired.’ ”) and photos of young people holding their own “We’re Debt Free!” signs. YouTube viewers, who skew young, are also gravitating to Ramsey. Over the past year, his channel got a whopping 35 million views, according to data provided to MONEY by social media analytics company ListenFirst Media. The company also said that 60% of people who talk about Ramsey on Twitter are millennials. His SEO team, too, is at the top of its game. Google “how to get out of debt,” or any variation of that phrase, and the results will probably take you to Ramsey’s website. That’s how Jeanna and Jerald Maghirang, a married couple in Brooklyn, stumbled onto his advice in 2016. They had just gotten laid off from their jobs within a few months of each other. And they were engaged at the time, so they had to charge both wedding and everyday expenses to their credit cards—adding to their mounting student loan debt. By the time they found new jobs, they were $60,000 in the red. In a panic, the Maghirangs watched a bunch of Ramsey’s YouTube videos—which are mostly just recordings of his radio show—and decided to give his “baby steps” a try. Jeanna and Jerald go to church, but that’s pretty much the only common ground they have with Ramsey. They’re both 33 years old and do birthday photo shoots of their pug, Louis. Jeanna DJs. And still, after a year and a half of doing things by the Ramsey book—eating rice and beans for dinner, selling stuff they didn’t “need or love” at consignment shops—they were debt-free. The thing about being a young person in debt is that, before long, it starts to define you. In all likelihood, you dipped your toe in as a teenager or in your early twenties. You probably didn’t know about minimum monthly payments or compound interest. If you took out a student loan, contributing to the $1.5 trillion Americans have borrowed for school, the implications of how long it would take to pay it off were probably not top of mind. Maybe you wanted to go to college so bad that you didn’t really care. Ramsey’s advice is a reality check that forces you to reckon with how shortsighted those early decisions were—life-changing decisions that, even if you were a remarkably self-aware 18-year-old, were thrust on you at the worst possible time. So while there’s no shortage of “hip” money gurus these days—like “Broke Millennial” Erin Lowry (age 29), “Bad With Money” Gaby Dunn (30), and “Mr. Money Mustache” Peter Adeney (45, but “cool”)—millennials are drawn to Ramsey for the same reason their parents started lapping up his advice three decades ago. He redeems them. Take the “debt-free scream.” Most air days, Ramsey invites longtime listeners to recount how they paid off a massive amount of debt with his advice. At the end of the segment, they take a deep breath and shout, “We’re debt freeeeeeeeee!” into the mic. Watching these segments—and there are hundreds on YouTube—is like watching someone join the ranks of the born-again. For participants, it’s a powerful, therapeutic act that gets at everything being a Ramsey follower is about: After years of drowning in sky-high bank statements, escalating interest fees, and calls from debt collectors, you finally get to breathe. As newlyweds, Drew and his wife, Farrah, 30, were $200,000 in debt (which included their mortgage). For five years in their mid-twenties, the Ohio couple lived off a zero-based budget—mapping out literally every dollar spent and earned. They packed lunches, cut cable, and started a few side hustles. Farrah Keller celebrates being debt-free at her home in Ohio. Despite what Ramsey says, much of what he tells people to do with their money isn’t all that weird. Experts argue that it doesn’t take a financial planner to know that if you get hyper-focused on paying off debt, devoting a year or a couple of years to living considerably under your means, your financial life will be transformed. All in all, it’s objectively simple, no-nonsense advice. But it might not be the best advice. For years, critics have lambasted Ramsey’s “debt snowball” method as being too “one size fits all” to work for everybody. His all-or-nothing advice for attacking debt—socking every dollar, aside from a $1,000 emergency fund, into paying it off—doesn’t give you much of a cushion should an emergency actually happen. Other Ramsey-isms, like telling people not to contribute to their 401(k)s until their debts are paid, paint with equally broad strokes. 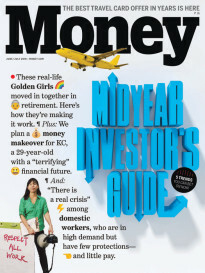 In a 2013 story in this magazine, journalists Felix Salmon and Susie Poppick skewered his investing advice too. Ramsey recommends a portfolio of only stock funds (no bonds), on which, he says, you can expect a 12% return long term. This is “unhinged from the reality of the investing world,” Salmon and Poppick counter. Ramsey has backed off from giving investment advice in recent years, but he still deals only in absolutes. He links debt with stupidity—and doubles down when it comes to student loans. In one particularly excruciating rant—which lives on Ramsey’s website under the heading “student loan meltdown”—he tears into a caller who spent $130,000 on a psychology degree and is now a stay-at-home mom because she can’t find a job. Clearly distraught, the woman tells Ramsey that she’s been looking for work for years, and while she knows getting an advanced degree would make her a more appealing candidate, she just can’t afford it. Ramsey mutes her (or hangs up, it’s hard to tell) and tells every parent listening that “if your kids are that stupid, jack ’em up. Seriously.” And then he starts screaming. $130,000 TO GET AN UNDER-GRADUATE DEGREE IN PSYCHOLOGY? THAT’S CRAZY!!! WHY? SO THAT WHEN YOU HAVE BABIES, YOU GET TO GO HOME AND BE A MOMMY? …YOU KNOW WHAT A PSYCHOLOGY DEGREE WITHOUT A MASTER’S IS WORTH? NOTHINGGGGG!!! NOTHINGGGGGGGGGGG! ABSOLUTELY NOTHING! YOU CAN’T GET A JOB IN A FACTORY WITH THAT DEGREE!!! He bills these blowups as a sort of righteous indignation, or “tough-love parenting,” but they’re closer to bullying. Ramsey reminds listeners again and again and again that he worked his way through college, so they should be able to do the same. Never mind that the price of tuition and fees at public, four-year institutions has gone up nearly 300% since Ramsey graduated in 1982. Or the myriad other economic factors facing young people today—like skyrocketing home and health care prices, and an overall cost of living that, according to a December 2018 survey from GoBankingRates, forces renters in 13 states to spend more than 50% of their income on necessities. If you hold off on school until you can afford it or take classes piecemeal to avoid loans—“go slow and pay cash,” as Ramsey would say—you might actually graduate debt-free. But you’ll enter the workforce later than your peers, with a salary gap that could follow you for the rest of your career, says Robert Kelchen, assistant professor of higher education at Seton Hall University. “It’s virtually impossible to get through college without debt, unless you want to take eight to 10 years or your family is independently wealthy,” Kelchen says. Anna Webber—Getty Images for SiriusXM. Ramsey’s take on wealth—who has it and why they have it—can also sound deliriously shortsighted. “Broke” is an attitude problem, not a societal one, he says. If you’re in debt, you’ve only got yourself to blame. And if you’re rich, well, that’s due to your own dogged determination. And make no mistake: Ramsey is filthy rich. With one of the most popular radio shows in the country, multiple bestselling books, and business partnerships that range from a network of finance professionals who pay for his endorsement to thousands of Financial Peace University classes offered in churches across the country, Ramsey isn’t just a debt-free messiah anymore—he’s a debt-free mogul. There’s a Dave Ramsey board game now and a “storytime book set” for kids. In March, Ramsey announced the inaugural Live Like No One Else cruise, scheduled to set sail in 2020. He’s also got a new headquarters in the works—a 47-acre campus in Williamson County, Tenn., set to open this summer. “We’re moving at the speed of cash,” Ramsey said in a press release. Industry estimates put his net worth at around $55 million. It would be easy, here, to roll your eyes at the millennial-age fans keeping Ramsey relevant. You could say they’re drinking the (generic, budget-friendly) Kool-Aid and bolstering an ideology that isn’t as universal as it claims. But if Dave Ramsey is a religion, his young followers are more like “Cafeteria Christians” than the blindly devout. They approach his advice with equal parts reverence and incredulity—gravitating toward the bits that resonate with them, like budgeting and attacking debt with everything they’ve got—and make smart decisions about everything else. Andrew and his wife, Amanda, had $55,000 in student-loan debt when they started Ramsey’s “baby steps.” For a little over a year, they lived on a monthly grocery bill of “a couple hundred bucks” and whittled their lifestyle expenses down to almost nothing, he says. When they needed a couch but didn’t want to spend $250 on a new one, they sat on the floor. Instead of throwing down $40 for a new trash can, they just … put their trash in a bag. In 2015, Andrew and Amanda traveled to Tennessee to do their “debt-free scream” on Ramsey’s show—in the accompanying YouTube video, they’re glowing. They don’t really follow Ramsey’s advice anymore, Andrew says. He owns his own business and says it makes more sense for him to prioritize growing and investing in his company than obsessing over the “baby steps.” But he credits the radio host for kick-starting the life he has now. I ask Andrew how long it would have taken him to pay off his debt if he’d never found out about Dave Ramsey.